VuPoint Solutions Magic Wand Portable Scanner - Ever want to put all of your pictures on your computer but didn't have the time to sit there and scan one after the other. Ever thought of buying one those scanners but you don't have any room in your office to store it. Then the VuPoint Solutions “Magic Wand” Portable Scanner is perfect for you. The VuPoint Solutions "Magic Wand" Portable Scanner allows you to scan the documents that matter the most to you, and back them up on your computer. Do you have those documents that you've had for a while and you're afraid that they're going to rip or even get lost one day. We'll now you can scan them and keep them safe. Scanner for color & monochromatic images, documents, magazines. Scanning Speed: A4 Size: high resolution with color ≤ 28Sec, High resolution with mono ≤ 14Sec, Standard resolution with color ≤ 8Sec, Standard resolution with mono ≤ 4Sec. Battery Life: ≥ 200 min. Includes: USB Cable, 2xAA alkaline batteries, Pouch, User's manual. Dimension: 10” L x 1.2” H x 1.1” W. Weight: 0.47 lbs. Create-Your-Own iPad Case Helps Celebrate St. Patrick's Day - Customers looking for a personalized iPad case often have to settle for a clip-on back without any front protection. iGear’s new Personalized iPad Case provides excellent protection while offering full personalization, giving customers the option to create one-of-a-kind iPad cases using their favorite St. Patrick’s Day artwork. While some cases on the market offer some of these features, finding a customized iPad case generally means giving up front protection, since almost all customizable cases only are available as a one-piece clip-on style for the back of the iPad. Although a magnet-attached smart cover can be added, many users are thinking twice about this combination because of the horror stories of users grabbing onto the cover while the iPad itself does a free fall. The new Custom iPad Case from iGearUnlimited.com delivers on all points. The case is engineered to great precision and the iPad fits snugly. The lightweight hard shell case is made with polycarbonate, one of most durable materials around, protecting the iPad from daily use and abuse. The iPad is completely enclosed from all sides, with precise cutouts for all ports and buttons. 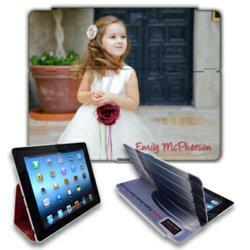 The Custom iPad Case comes with two sets of magnets – one set to activate the iPad’s auto wake/sleep feature, and another to keep the case closed when not in use. Using three strategically positioned hinges, the iPad can be positioned at five different viewing angles, from completely flat to vertically tilted for use in any situation. Kindle Fire HD 7.0 Best-Selling Tablet on Amazon - Mingyaa, a website dedicated to providing Amazon deals and information, has recently released a review of the best-selling tablet on Amazon. 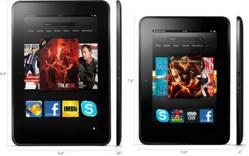 Mingyaa, an Amazon related website, has recently released its review of the Amazon Kindle Fire 7.0. 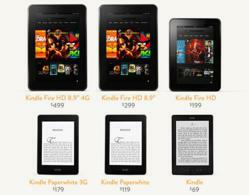 As Amazon’s best-selling tablet, the Kindle Fire HD 7.0 offers the best value for the price, with impressive features. The article made note of the Kindle Fire’s 7″ HD display utilizes an advanced polarizing filter and anti-glare technology which gives a rich color as well as a deep contrast from every angle. In addition, the device also features Dolby audio, dual-band stereo speakers and auto optimization software which gives users crisp, clear, balanced audio. The Kindle’s Wi-Fi capabilities on the fastest 4G LTE network are superior to its competitions, and the article also mentioned that the 7” Kindle Fire is available in both 32GB and 64GB. Mingyaa.com’s unbiased review had a few different aspects, with one of the main focuses being how the Kindle 7.0 has found a solution to the major air gap problem which plagues most other tablets. Most tablet displays are comprised of an LCD plate which has one plate of glass on the bottom of the tablet with a glass touch sensor on the top. These two pieces are commonly separated by an air gap which causes a major problem. The light then reflects off of every surface with the air gap, and as it passes through from the front creating a significant reflections which decrease the quality of the display. In its recent review, Mingyaa.com clearly noted that the Kindle Fire 7.0 solves this problem by laminating the touch sensor in conjunction with the LCD into one simple layer of glass. BlackBerry Torch 9800 Tech Specs Review and Price Comparison Available Via Find My Price - According to Ironclad Integrity Ltd BlackBerry devices are numerous on Amazon’s best seller list for GSM handsets, but buyers are having a hard time identifying the smartphone that will deliver the most bang for their buck. FindMyPrice.net delivers the first full review of the products available on this list and with the occasion it offers discounts on BlackBerry Torch 9800 model. GSM smartphones are some of the most desired products today, since this particular feature averts costs with a new phone subscription, but not many of the popular brands today come cheap. FindMyPrice.net is currently reviewing the offers available for BlackBerry Torch 9800 available with online retailers, striving to help buyers find the lowest price for their desired handset. Buying a smartphone is not necessary a pricier investment, since such a device becomes more valuable when it’s time to resell it. It also gives users the freedom of using whatever network SIM they want without signing a new subscription with a phone carrier. Since BlackBerry devices are designed to work internationally, the feature becomes a money-saving asset for the user that travels oftentimes abroad. BlackBerry Torch 9800 smartphone is a 4.37 x 2.44 x 0.57 inches and 5.68 oz touchscreen smartphone with optical trackpad, multitouch, a slide-out full QWERTY keyboard, BlackBerry OS 6.0, 5MP primary camera with LED flash, autofocus, geo-tagging and image stabilization. It features Blue Bluetooth 2.1, Wi-Fi 802.11 b/g/n, HSPA 3.6 for Internet, good voice quality, no noise cancellation, 5 hours 30 minutes talk time battery life, social networking apps and BlackBerry maps. Custom Engraved iPhone Bamboo Case - Racer: Custom Engraved iPhone Bamboo Case Raises the Bar in Personalized Protection - iGear’s Bamboo Case for iPhone 4 and iPhone 5 is wildly popular for its stylish look and solid protection. The new custom engraved version features personalized artwork such as logos and monograms on the same eco-friendly natural bamboo case. 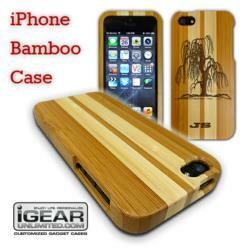 iGear's Custom Engraved Bamboo Case features two racing stripes, earning it the "Racer" name. Although bamboo is very lightweight, it's one of the strongest natural materials around, and also makes it one of the most environmentally friendly. The case protects all sides and corners of the phone, with precision cut-outs for accessing ports and buttons. It features a soft velvet lining that protects the sensitive back of iPhone from scuffing and scratching. All ports are accessible without removing the case. The new laser engraving option allows customers to upload their favorite artwork and make an one-of-a-kind phone case. Using an easy-to-use online Interactive Designer, customers can upload, crop, scale, and position the artwork on the fly. Adding customized text and approval of the the finished design all happen directly from within the web browser instantly. Popular engraving artwork includes sports team logos, company logos, movie and cartoon characters, and personalized monograms. Upgrade your Apple Tablet to the Latest iPad with 128GB Internal Storage: The Apple Surprise: a 128GB iPad - CashforiPads Asks, Will an iPad With Expanded Storage Erase Apple’s Recent Slips? 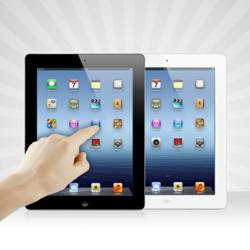 Since bursting into the scene, 120 million iPads have been sold. With the Apple new product introduction cycle increased to twice from once a year and the company introducing a smaller 7-inch iPad, CashforiPads asks, will a regular-sized iPad with expanded storage be a hit in the market and continue Apple's dominance? This year,Apple not only announced a new version of the iPad with 128GB of internal storage way earlier than expected, but released it on February 5, only four months after the 4th generation iPad was introduced. We at CashforiPads think the closest and most plausible explanation behind this unexpected move would be the rather lackluster performance of the latest Apple releases, particularly, the iPhone 5. A report on January 14 by Reuters claimed that Apple has been reducing its component orders for the iPhone 5 from Japanese suppliers because, because according to Japan's Nikkei, the demand for the smartphone have not been as robust as expected, causing the company's stock to plummet. The big question now is whether this enhanced version will something the customers would like. So far, CashforiPads thinks the only downside to the iPad’s additional storage is the steeper price for the unit. 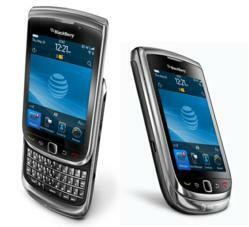 The suggested retail price for this new version is $799 for Wi-Fi only and $929 for the Wi-Fi + Cellular model. This is expensive for most users who do not have the extra cash. Other than that, the 128GB iPad is flawless because it is basically an iPad 4 with expanded storage. Then again, the seemingly hefty price tag of the iPad with 128GB storage should not be a problem for those who want to upgrade their current Apple tablet. Refurbishment sites like CashforiPads.com give top dollar for old gadgets. The proceeds of the quick and convenient transaction, plus just a few hundred dollars could easily be used to buy that pricey iPad with expanded storage. On the other hand, according to Apple, people are finding more reasons to use their iPads for work, school, entertainment or play. IPads are light, fast to boot up, and easy to use. The best thing about tablet PCs is that they offer the mobility many people find important nowadays. As for the expanded 128GB storage capacity, CashforiPads thinks this is definitely a great addition to the already powerful iPad. With this extra memory, users can store as many movies, photos, music files, and documents they want without worrying about the processing speed of the gadget. Those whose work entails a lot of graphics or music will really be happy with this new iPad. Latest iPhone 5 Portable Chargers - Several iPhone 5 Battery Cases and Power Banks with MFI Will Be Released Next Week - The first power bank for iPhone 5 with MFI certificate will be launched by Esorun next week. Mass 8-pin connectors will be released by Apple’s authorized factory from 18th Feb, which means several battery cases and power banks for iphone 5 will be launched to market soon, including Esorun’s BC01 battery case. 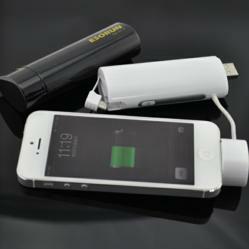 The first power bank for iPhone 5 is being launched and released by Shenzhen Esorun Technology Co. Ltd. This iPhone 5 power bank uses an official 8-pin connector and comes with a MFI certificate. The iPhone 5 is the latest luxury and must have product from Apple that everyone is crazy about. The thinnest, lightest and fastest iPhone from Apple is an upgrade to its already elite line up of smart phones and many iPhone lovers have already gotten and been enjoying this amazing product. Portable chargers have also been a popular item especially for travelers. With cell phones being such an essential in a person’s life, it’s very difficult when one is on the go and his mobile phone dies. It is very convenient for people to charge a portable charger and bring it along where ever they go in case they need to charge their mobile phones. Mass official 8-pin connectors will be released by Apple’s authorized factory from 18th Feb, when Chinese new year holiday ends. Several iPhone 5 battery cases and power banks for iPhone 5 will be launched to market soon, including Esorun’s BC01 battery case. Samsung Galaxy S3 GT-I9300 Pros & Cons 2013 Prices and Deals Review Revealed Via Find My Price - Ironclad Integrity Ltd reveals via FindMyPrice.net comparison service, the full review for Samsung Galaxy SIII/S3 GT-I9300’s tech specs and also looked at analysts’ predictions for the smartphone’s price evolution as it aimed to see if there’s any potential for discounts on this particular product. When it comes to the best smartphones in the market, prices are usually high. 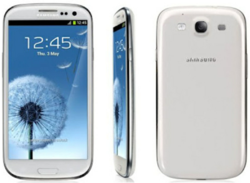 FindMyPrice.net releases the full review for Samsung Galaxy SIII/S3 GT-I9300 (the international factory unlocked handset) as well as an estimate for potential discounts on this particular device with online retailers. Samsung Galaxy SIII/S3 GT-I9300, the factory unlocked international version, starts selling on Amazon at $500, but the listed price pushes well over the $800 mark. With phone carriers, the phone is available at much more affordable prices, but that constrains the buyer to a selected list that brings along new limitations and caveats because of the network. Discounts and special deals make the unlocked version more appealing for the buyer who isn’t interested in signing a new contract with a carrier. As one of the most popular handsets, Samsung Galaxy SIII/S3 GT-I9300 offers a list of well-performing tech specs, including a fast quad-core 1.4GHz Arm Cortex-A9 and 1GB RAM, Android Ice Cream Sandwich (or higher) and Samsung’s TouchWiz. The handset is directed at multitasking and offers the users features such as NFC (Near Field Communication) for phone-based payments, as well as the S Beam function that sends large files using a Wi-Fi connection. Samsung Galaxy SIII also brings to the table a powerful HD Amoled screen, a battery life that promises about 50 hours of (minimum) usage, an 8MP camera with smile detection, autmatic tagging, Buddy Photo Share and face recognition, as well as a personal assistant called S Voice. The handset is compatible with 2G Networks (GSM 850 – 1900), 3G Networks (HSDPA 850 – 2100) and 4G.